A few years ago, you may have never come across the term “interchange fees”. Instead it was reserved for those in the banking world to discuss the profit margins of banks. However, fast forward to 2017 and you’ve probably seen it pop up more and more in the news, with the media talking about how RBA regulations around interchange fees could devalue your rewards credit card. You might have thought, well that’s all well and good, but what on earth has it got to do with interchange fees. Interchange fees are wholesale fees set by card schemes such as MasterCard, Visa and eftpos that require payments from the merchant's bank to the cardholder's bank on every transaction. Step 1: The customer makes a purchase in-store. Step 2: To accept this payment the merchant is charged a service fee by their bank. They can decide to pass this fee onto the customer in the form of a merchant service fee or absorb this cost. Step 3: When the merchant’s bank receives the service fee, they will keep a portion and pay another portion to the cardholder’s bank - this is called an interchange fee. Step 4: With the interchange fee, the cardholder’s bank will then use part of it to go towards their profits and the remainder towards providing customers with credit card perks like rewards points. As you can imagine these interchange fees really work in the favour of the banks, as both the merchant’s bank and the cardholder’s bank get to keep a portion of the profit from the service fee charged to the merchant. So why are rewards cards being devalued? Here’s the major game changer: In May 2016, the RBA placed a lower cap on the interchange fees that banks could charge, limiting it to 0.8% of a transaction for credit cards. This new regulation kicks in on July 1 2017. What this means is both the merchant’s bank and the cardholder’s bank will earn less profit from these fees. Rather than take the hit to their bottom lines, many banks have already reduced the value of their rewards cards, even before the changes come into effect. In fact, according to Mozo’s database since the RBA announced this cap, all four of the major banks CommBank, ANZ, Westpac and NAB have reduced the value of their rewards cards, as well as challenger banks including Citi, Virgin Money, and Suncorp. And more credit card providers are set to follow in the coming months. What can I do about my rewards card being devalued? - Reduced earn rates. This is the obvious one to look out for. If you notice the points earned per $1 spent drops, that’s a good indicator your credit card provider is trying to recoup the loss from the interchange fee cap through devaluing earn rates. - Annual fees going up. 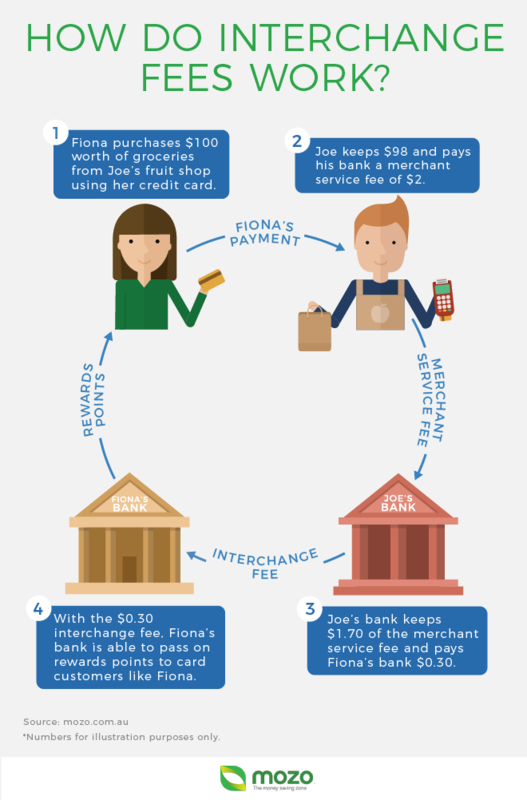 Another thing we’ve noticed at Mozo is banks increasing annual fees on rewards cards since the RBA announced these new interchange fee regulations. So even if you have a credit card with a generous points offering, if your card provider ups your annual fee significantly this could outweigh the benefit. - Points caps/expiry dates.While the points you earn and the annual fee are obvious features to look out for, credit card providers are also taking more sneaky tactics - lowering the limit on the amount of points you can earn and introducing shorter expiry date periods. If you think your rewards credit card may have been devalued as a result of the new RBA regulations, there’s one thing you should do - plug your numbers into our rewards revealer tool, which will do the hard work for you and show you the better value cards in the market for your spend.